Corey Ruben already understood the important need for bone marrow transplants when he joined the Gift of Life registry during the University of Maryland’s Terp Thon in 2013. Two years earlier his cousin had donated marrow for Corey’s uncle to treat Acute Lymphoblastic Leukemia. A recent graduate of the University of Maryland, Corey knew how rare the chances were of being a match for someone and was thrilled and excited when the call came. He would be donating peripheral blood stem cells to a man with a type of leukemia in need of a transplant. Corey, age 22, recently received the first update on his recipient and it’s positive: he is doing well and is now recovering at home. 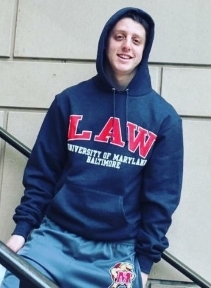 Corey graduated from the University of Maryland in 2016 and has started his first year at University of Maryland Francis King Carey School of Law. He enjoys playing basketball in his free time.